COVINGTON, Ky. — A few dozen people gathered outside the Roman Catholic Diocese of Covington Tuesday, some standing in support of Nathan Phillips, the member of the Indigenous People's March seen playing a hand drum in online videos that have stirred up controversy nationwide. Other people who attended the event voiced their support for the students of Covington Catholic High School, while others said, "let’s stop the finger pointing." Tuesday morning the American Indian Movement of Ohio and American Indian Movement of Indiana and Kentucky organized a "peace vigil to call for an end to racism." Organizers are calling on the diocese to work with the American Indian Movement chapters to continue a conversation about race and identity. They are also calling on the diocese to better educate young people on these issues following Friday’s events in Washington, D.C.
"Here we are, everybody's pointing fingers. Let's stop the finger pointing. Let's stop putting blame," said organizer Guy Jones. "Let's go and come together and create a dialogue where we can begin to grow." The groups added, "Their behavior at this point is still a problem, even if they did not create the initial situation." Many videos showing multiple angles and moments throughout the altercation have surfaced in the days since, showing different perspectives of the same event and raising questions — and more controversy — about who acted inappropriately and what exactly was inappropriate. "I think the CovCath kids were provoked," said Nick Boschert, who attended Tuesday’s rally. "For them to get death threats and for people, even after watching all the videos, still to say, 'Well there's blame to go around for everybody,' is just a false equivalency." 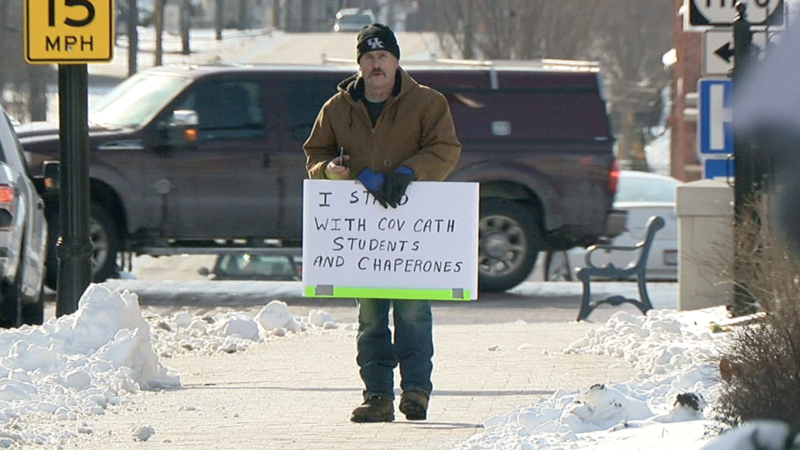 Another man’s sign read, "I stand with CovCath students and chaperones." Covington Catholic school officials alerted parents that the school would be closed Tuesday in order to keep students and faculty safe. Each statement agrees the confrontation began when a third group of people yelled racial and homophobic slurs at the CovCath students. Philips then steps between the two groups, and this is where accounts deviate. A statement made Monday night by Covington Catholic High School principal Robert Rowe said an "independent third-party investigator” will look into the Washington, D.C. incident. The Diocese of Covington said Tuesday that the investigation would begin this week. "On Monday afternoon the Covington Police alerted us that they had intelligence concerning a planned protest, Jan. 22, at Covington Catholic High School and a vigil at the Diocesan Curia. Due to threats of violence and the possibility of large crowds the Diocese was advised to close Covington Catholic High School, the Diocesan Curia and neighboring Covington Latin School. We thank law enforcement officers for their protection and will reopen when they say it is safe to do so. We pray that we may come to the truth and that this unfortunate situation may be resolved peacefully and amicably and ask others to join us in this prayer. We will have no further statements until the investigation is complete."